Security: Could drones be the new 9/11 airplanes? For years we had thought that only airplane could destroy buildings in a terroristic attack, or carbombs, but never we had seen something like the 2 alerts that create panic in Tokyo and Washington. 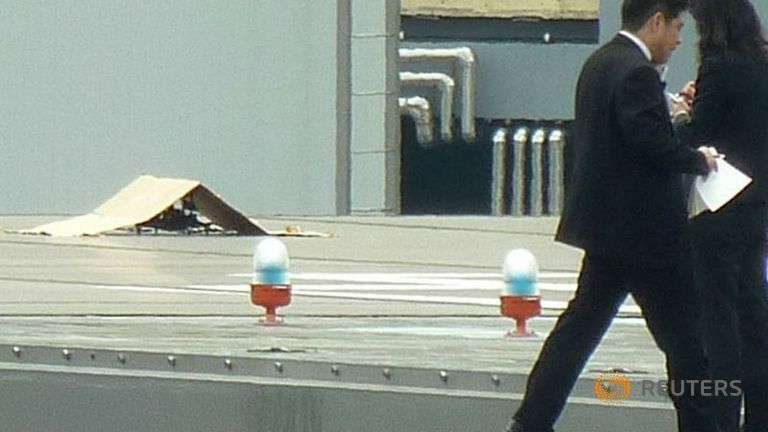 In April 21 a drone carrying a small camera, a water bottle and a flare and marked with a radioactive sign was found on the rooftop of Japanese Prime Minister Shinzo Abe’s office. The significance was not immediately clear, but a Japanese court on Wednesday approved the restart of a nuclear power station, rejecting worries about safety of nuclear power in the wake of the 2011 Fukushima radiation disaster. Televised aerial footage from the scene showed what appeared to be a drone with propellers covered under cardboard and later a blue tarp. Dozens of police officers were seen crowding around the object. Japanese broadcaster NHK said an official at the premier’s office found the drone and that the device was around 50 cm (20 ins) in diameter. Abe is in Indonesia to attend an Asia-Africa summit. An official at the prime minister’s office declined to comment. A small drone crashed in the grounds of the White House in January, raising pressure in the United States to clarify regulatory guidelines. Earth Day: What could you do for our planet and the community resiliency?